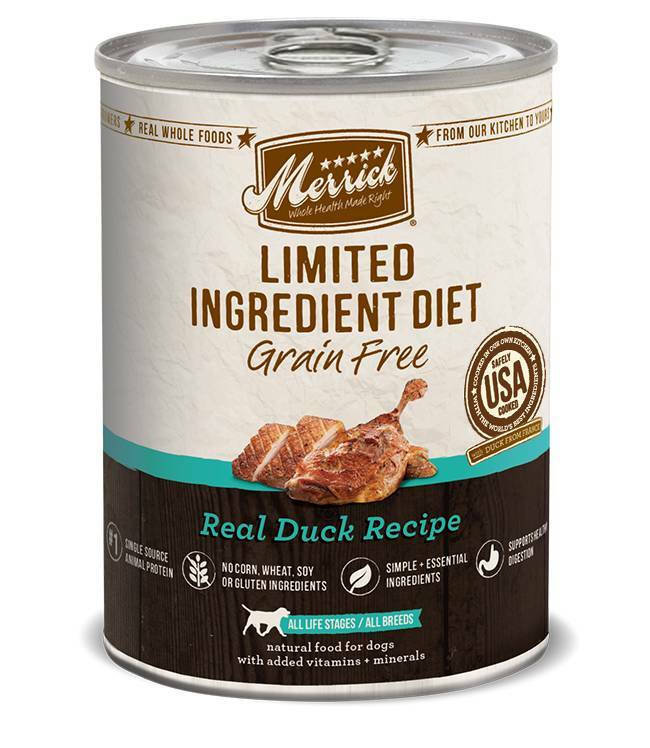 Home » Merrick LID Can Dog Food Duck 12.7 oz. Merrick LID Can Dog Food Duck 12.7 oz. Deboned Duck, Water for Processing, Dried Peas, Natural Flavor, Calcium Carbonate, Sodium Phosphate, Potassium Chloride, Salt, Agar-Agar, Flaxseed, Vitamins (Vitamin E Supplement, Vitamin B12 Supplement, d-Calcium Pantothenate, Vitamin A Supplement, Niacin, Vitamin D3 Supplement, Riboflavin Supplement, Pyridoxine Hydrochloride, Folic Acid, Biotin, Thiamine Mononitrate), Choline Chloride, Minerals (Zinc Amino Acid Complex, Iron Amino Acid Complex, Manganese Amino Acid Complex, Copper Amino Acid Complex, Potassium Iodide, Cobalt Glucoheptonate, Sodium Selenite), Locust Bean Gum, Xanthan Gum.